“We look at glass just as a painter looks at a blank canvas – a sparkling tabula rasa of endless possibilities.” – Janelle Baglien, President, Studio Art Direct, Inc.
Art-on-glass installations are catching fire. Large-scale, reflective and stunning, designers and architects know that glass is the secret to adding reflectivity, transparency and sparkle to a space. In the past, to achieve the ethereal glow that glass can create, designers were relegated to standard decorative glass options. Not anymore. With new technologies, art can be applied to glass to create gorgeous installations for space dividers, privacy walls, windows or full walls. The installations can be transparent, diffused or fully opaque. The artwork can vary from line drawings, doodles, illustrations, words, paintings, photographs or solid chunks of graphics. To add the final touch, lighting can be added to create a sparkling diamond in the sun effect. Whether lit from behind, surrounded by a warm halo, or just ambient spot lights – the possibilities are endless and irresistable. 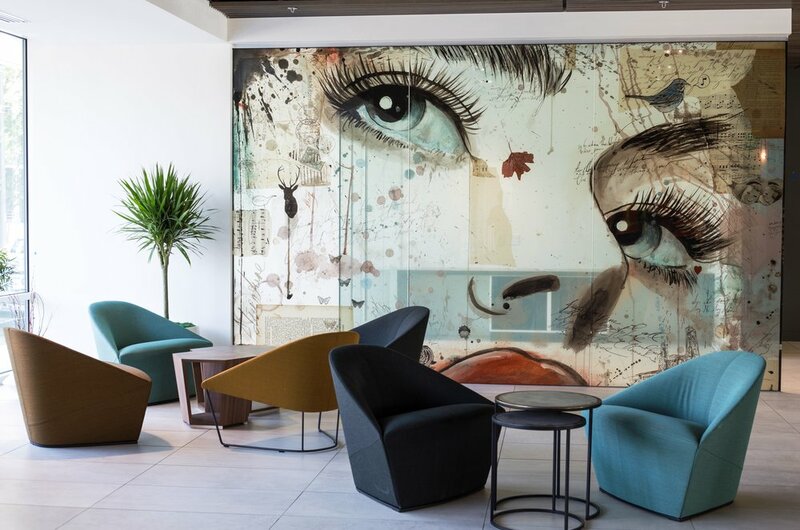 “We are seeing exponential growth of custom artwork on glass,” says Janelle Baglien, president of Studio Art Direct, a corporate art consulting firm specializing in healthcare and hospitality projects. “Designers and clients are demanding highly customized looks so that spaces can stand out against the competition.” Used for both exterior and interior installations, custom created art glass is the new art frontier in the architecture world. The explosion of growth in digital printing on glass has been matched by rapid technology innovations but is still in its infancy. It is an expensive application with only one shot to get it right, so I am extremely diligent about finding the right artwork that will enhance the design coupled with the right print technique. I am constantly learning the new advancements coming down the pike in terms of costs, best solutions, and changes in the industry of inks, durability, size capabilities and resolution. Is there a “best” way to print on glass? Of course not. Selecting the right image and process is going to be different for every circumstance. How an image reproduces on glass that is heavy, fragile, hard, and non-porous takes expertise. All of these factors create their own problems, and there is no perfect answer. But if it was easy, everybody would be doing it. Here we share our boots-on-the-ground knowledge and experience with art on glass installations. UV-cured inks are printed direct to the glass with specialized flatbed printers.UV inks contain an adhesive that helps the pigment bond to the glass. This method does not require any special preparation to the glass (such as etching, adhesion promoters or chemical treatments) and does not require firing or extensive drying times. Printing to the backside of the glass allows the end product to be protected by the glass itself. Using digital printing is akin to any digital art print with a wide wide range of colors and resolution. However, the ink colors are not translucent on glass, but also not completely opaque, leaving them looking a little dull compared to other methods. It does make the art image pop because the glass enhances the colors. To intensify the color and opacity for a richer, deeper image, the art is printed with several passes – or what is known as a double hit. Digital printing direct to glass is an excellent solution for glass installations where the back surface of the glass in which the image is printed is protected. For example, glass mounted on a wall with stand offs. While several systems have been developed for better adhesion, we do not recommend it for high durability areas because the potential for scratching. This method can be used for outdoor installations but only for short-term. Panels as large as 7’0″ x 10’0″ can be created. Applications for printed glass include bar decorations, furniture glass, wall mounted, and mounts to substrates with stand offs. Ceramic Frit Ink requires not only special inks, but also a special printer, ink dryer and glass kiln. The results are worth the cost if a highly durable solution is required, such as a floating glass wall. After printing with ceramic-frit, the ink is cured in a dryer and then fired in a glass kiln. After that it, is quenched and cooled—a fairly large process. Printers typically can vary the amount of translucence and print density, allowing for brilliant stained-glass effect colors. Spot colors are available, as are opaque backing inks and etch appearance inks. These are inorganic inks that are fired right into the glass, they will last a long time outdoors or indoors and withstand the maximum abuse. Most panels are guaranteed for life. Back in the day, vinyl was white and opaque, perfect for covering glass with delightful images, but no light came through, no transparency. Then two products were invented. One was perforated film which allowed one-sided viewing of the image, while it appeared to disappear on the other side. This is what is used to wrap transit bus windows. The other was clear printable films with optically clear adhesives. Imaging onto these materials is done with standard solvent inks making it very easy. Vinyl application to glass is typically temporary and removable. It is also a cost effective way to dress up a window or tempered glass panels. However, not a great solution for durability. A new family of organic inks, called sol-gel—originally developed by researchers at the University of Illinois—are proving to be excellent for printing onto glass. This has a good side and a bad side. It means there is a better glass-printing solution than UV inks, but it also means a dedicated printer would be required. One big advantage is that sol-gel inks do not require a primer coat first. The glass does have to be cleaned, typically with acetone, before printing. And after printing, it requires baking at 200 degrees for 10 minutes. This results in a chemical bond of the ink to the glass for excellent resistance to weathering, scratching and chemicals. Since they are organic inks, however, fading is still a problem for long-term outdoor use.